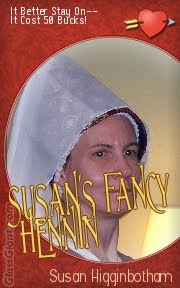 Medieval Woman: Blogging with Historical Novelist Susan Higginbotham: Happy Valentine's Day! For some past Valentine's Day fun, check out these candy hearts I did a few years back. I promise to be perkier soon! Haha, they're great! Happy Valentine's Day, and hope you feel better soon! Hope you feel back on form soon - those 'off' days are a real pain! What a fun site - I spent a couple of rainy hours generating my own romance novel covers. I went and checked out your older "hearts" one - what a hoot!